Epithelia constitute one of the major tissue types in all animals and form the basic building blocks of tubular organs in both vertebrates and invertebrates. 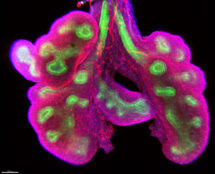 Simple epithelial sheets are also the basic starting point in the development of most animals. We want to dissect how simple epithelial sheets deform in a highly concerted manner to turn into complex tubular tissue shapes. We use the formation of the tubes of the salivary glands in the Drosophila embryos as our main model system, but have also begun to compare our findings to the related process of budding morpho-genesis in embryonic mouse lungs. Coordinated changes in the shape of many neighbouring cells, as well as cell rearrangements are the major drivers of tissue formation. Cell shape changes are driven by the intracellular cytoskeleton. We have in the past shown how crosstalk between the actomyosin cytoskeleton and microtubules is crucial to maintain a pool of actomyosin that drives apical constriction of cells during tissue bending. Coordination between cytoskeletal responses between neighbouring cells allows concerted tissue-scale changes in shape, often mediated through cell-cell adhesion receptors. We discovered that the apical polarity protein Crumbs, through newly identified homophilic interactions of its extracellular domain,can determine where a multicellular actomyosin cable is formed. In the future, we will further dissect how cytoskeletal crosstalk is regulated, and how cell-cell interactions affect and coordinate cytoskeletal activity. 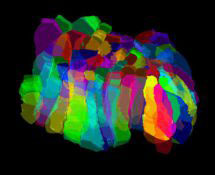 We will also use imaging and computational methods to segment and track epithelial cells in 3D over time to uncover novel cell behaviours that drive tube formation. 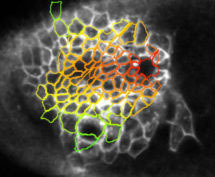 Radially-patterned cell behaviours during tube budding from an epithelium. The spectraplakin short stop is an essential microtubule regulator involved in epithelial closure in Drosophila. J. Cell Sci. 130: 712-724. The Gas2 family protein Pigs is a microtubule +TIP that affects cytoskeleton organisation. Integration of cell-cell adhesion and contractile actomyosin activity during morphogenesis. 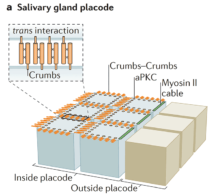 Anisotropy of Crumbs and aPKC drives myosin cable assembly during tube formation.